The late Art Fitzpatrick’s resumé tracks decades of artistic accomplishments, although perhaps his best known paintings are those he produced for Pontiac. Fitzpatrick’s work on their 'Wide Track' advertising campaign from 1959-1971 is credited with dramatically transforming Pontiac’s image and driving sales from 7th to 3rd place — a compelling testimony to the power of visual persuasion. ‘Fitz’ began his career in 1937 as an 18 year old automotive designer with John Tjaarda at Briggs Body (LeBaron) in Detroit. In 1938 Fitz was hired by ‘Dutch’ Darrin to serve as his firm’s in-house artist and delineator in Hollywood, California. Fitzpatrick is credited with designing the striking and seldom-seen Packard-Darrin convertible sedans and 4-door hardtops that were built in Connersville. When the Darrin operations were taken over by Packard, Fitzpatrick went to work for Werner Gubitz, the automaker’s styling chief and had a hand in the design of the 1942 Packard Clipper. After serving as a Naval Officer during World War II, he was lured into the Madison Avenue advertising world. For eight years he produced many Lincoln and Mercury ads. In 1949, Fitzpatrick began working with Van Kaufman, a painter of figures and backgrounds of Mercury ads.This collaboration and friendship between Fitzpatrick and Kaufman lasted until Van’s death in 1995. In 1953, Fitzpatrick began an unprecedented artist/client relationship: he signed an exclusive contract with General Motors that ran for 21 years. 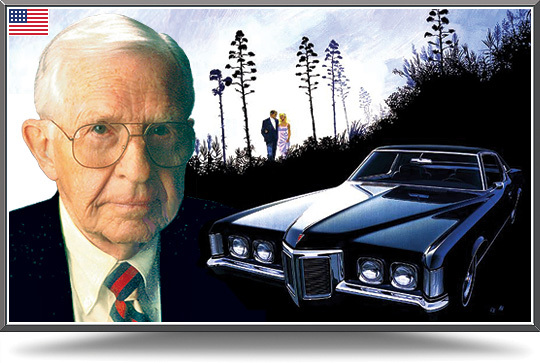 During this period he produced award-winning advertising art and graphic design for the GM Corporate, GM’s Buick Division, GM Europe, and GM’s Pontiac Division. Many well known clients including major magazines and Fortune 500 corporations such as General Electric, Uniroyal, and Texaco retained Fitzpatrick’s services over the course of his career. Art Fitzpatrick received over 40 awards for art, advertising, and design, (including top awards in international competitions with thousands of entrants). His work was recognized by millions of people in magazines all over the world for nearly 30 years. Feature articles on his life and work have appeared in leading automotive magazines on three continents, and in books on art, advertising, and automobiles. His work has inspired and guided at least three generations of automotive designers and illustrators. Art Fitzpatrick was an Honorary Member of both the Automotive Fine Arts Society and the Classic Car Club of America. He passed away in November 2015, aged 96.